Description: The UMI adjustable upper a-arm mount is a direct bolt in replacement of the original GM mount with some key improvements. The parts feature a unique fabricated design that allows for the mounts to be strong without adding any extra weight. The factory GM mount had a bowl shaped plate that was excellent at holding in water which quickly caused rust to the mount. UMI’s fabricated mounts allow water to easily drain out from the strut bolt, which can extend the life of the front shocks. 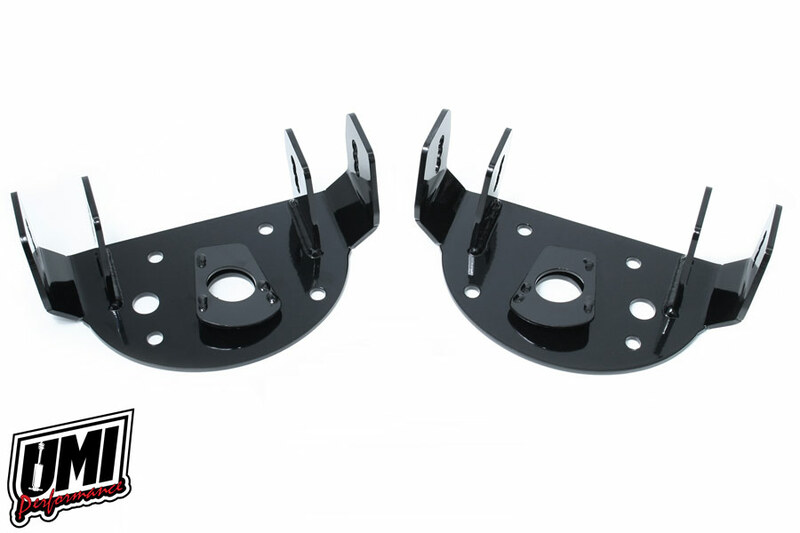 UMI’s fabricated mounts are also supplied with several upper a-arm adjustment holes for fine tuning the vehicles front suspension. The original factory holes are located at the center and driver has the option to raise or lower the a-arm mounting point 3/8 of an inch. Adjustment holes feature the ability to dial in the front roll center height. Raising the roll center height increases responsiveness and improves camber gain which allows a less aggressive street alignment to perform well when cornering. For street and drag applications choosing the center hole places the a-arm in the factory location. As always, these products are extensively tested on UMI’s test cars in some of the harshest highway and racing environments. This makes them an excellent upgrade for everyone from the street cruiser to the road course expert. Direct bolt-on with no drilling or welding required. Laser cut USA steel for clean and accurate components. Same weight as factory GM mounts. Works with factory and aftermarket a-arms. Fits factory style shocks that mount in the factory location.